England limited overs captain Eoin Morgan went back to school as the ECB and ICC announced the new exciting projects of the ICC Men's Cricket World Cup Schools Programme for this school term. The Schools Programme, which has been developed by the ECB, ICC and Chance to Shine is part of the wider strategy to use the ICC Men’s Cricket World Cup 2019 to engage one million young people between the age of 5-12 in primary schools throughout England and Wales in the lead up to – and duration of – the tournament. The programme includes a series of resources, assembly ideas, competitions and cross-curricular activities. These will all be available on the teacher’s portal via the Chance to Shine website. The next phase sees the introduction to projects ‘Welcome to our Area’ and ‘Playground Pundits’ – two projects that allow pupils to learn about the ten competing nations in the ICC Men's Cricket World Cup as well as learning the art of commentary and communication. 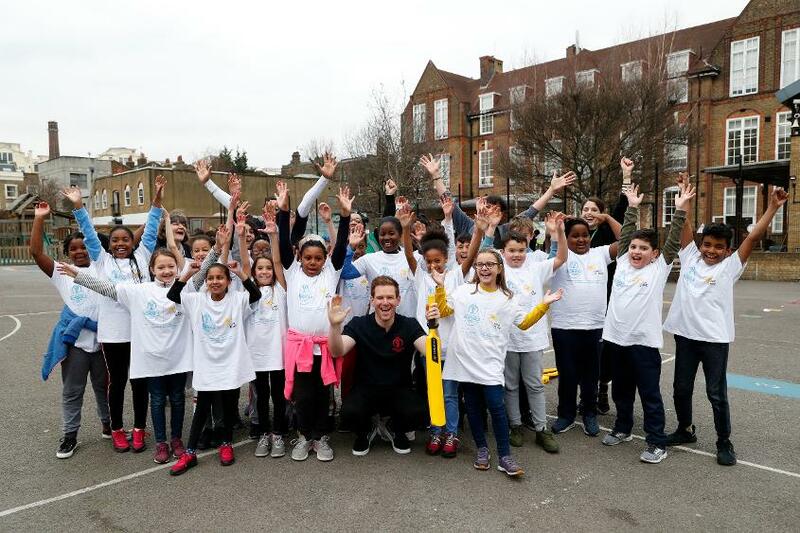 England captain Eoin Morgan was on hand yesterday at Grafton Primary School in Islington to spend time in the classroom and then take part in a cricket match with schoolchildren. Morgan said the ICC Men's Cricket World Cup can play a key role in inspiring the next generation this summer: ‘‘It was great to be back at school and see how excited the schoolchildren are about the Cricket World Cup, as a team we are really looking forward to the tournament and are now in our final preparation stage and counting down the days till our opening match against South Africa. “It’s important that we always look to try and inspire the next generation and help grow the sport especially in 2019 when we have the Cricket World Cup and a home Ashes Series - the more people talking about and playing cricket can only be a positive. Steve Elworthy, ICC Men's Cricket World Cup 2019 Managing Director, added: The ICC Men's Cricket World Cup School Programme provides a unique opportunity for cricket to inspire its next generation of fans and players by taking the tournament into clubs, playgrounds and classrooms across England and Wales. Children and Families Minister, Nadhim Zahawi, who oversees school sport across England, said: “Sport has so many benefits for children, from keeping them fit and healthy to teaching them about teamwork – that’s why in spring the Government will be launching our School Sport Action Plan, to help every child learn to love being active. “The tournament will truly inspire the next generation to get involved in this fantastic game and reap the benefits sport brings - from improved mental and physical well-being to learning life-enhancing skills such as teamwork and communication." For project four ‘Playground Pundits’, pupils will learn about the art of commentary and then are encouraged to give it a go using pre-prepared scripts or by using their own words. There is a competition element which will be attached to this project, with plenty of rewards and recognition, as children send in their best commentary attempts. Each winner will not only receive a class set of tickets to an ICC Men’s Cricket World Cup match but also a ‘Venue Match Day Experience’ which includes a visit to a Match Media Centre.